This entry was posted on June 22, 2018 by Sew Essential. For the last year I have been working on an extremely exciting project with my friend Anne. 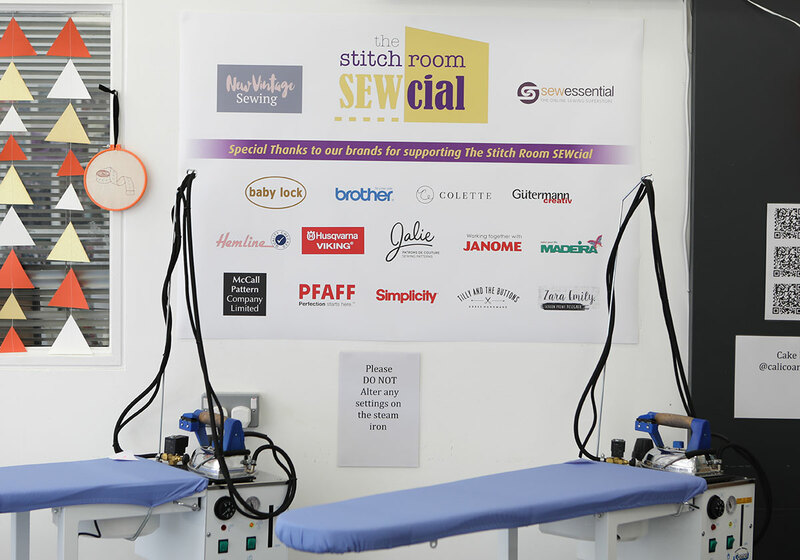 Last weekend all our hard work came to fruition and we hosted the Stitch Room Sewcial, a two day sewing event, at Loughborough University. With a truly unique offering of activities and a wonderful group of delegates I think it is safe to say it was a huge success. Find out what we did and more importantly how you can be involved in the next one! I met Anne two years ago this August through our mutual love of sewing. 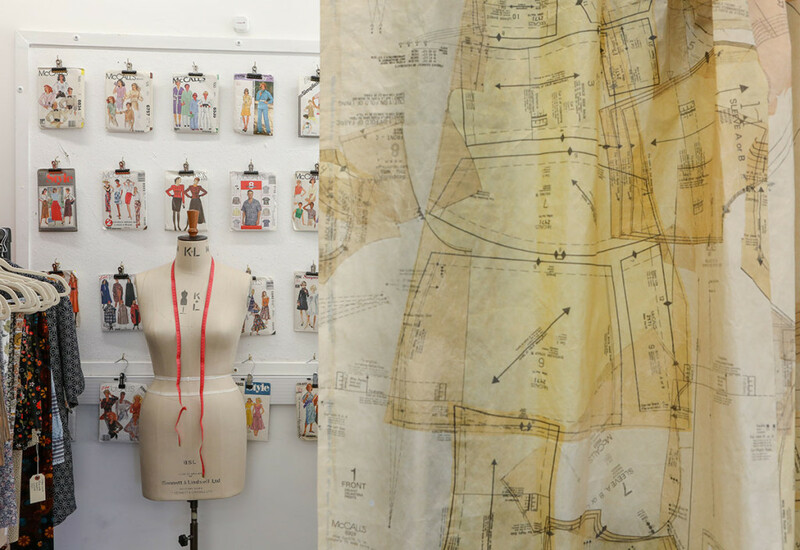 Anne is a Technical Tutor on the Textiles: Innovation and Design degree course at Loughborough University and invited me to visit the textile degree show last year. I was blown away by the talent of the students and could have spent all day ogling their beautiful work. 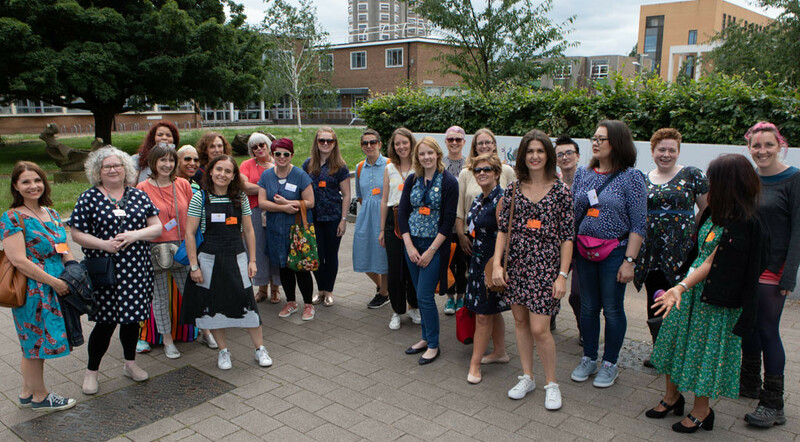 Anne asked whether I would like to help her to organise a sewing social event around this year's show and I jumped at the chance! I knew our sewing buddies would be just as excited and enthused as I was and couldn't wait to share it with them. 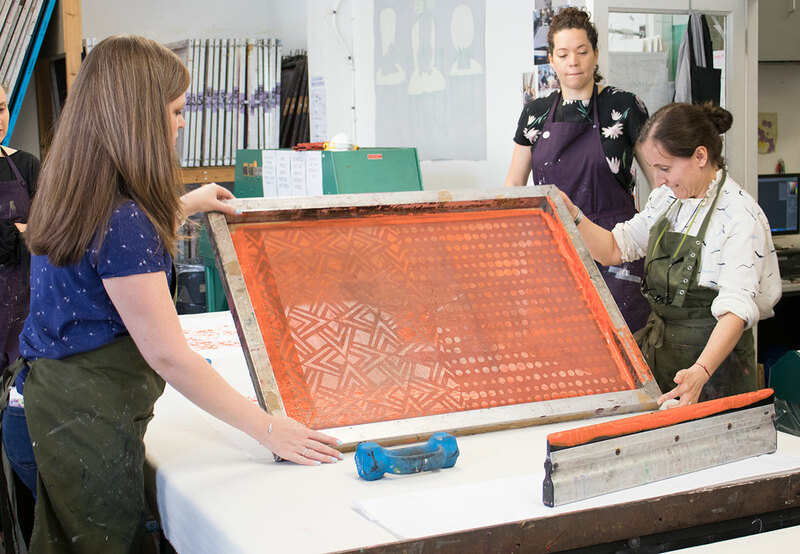 The delegates would also have the chance to visit the print rooms and weave shed to see demonstrations of how the students create their work. 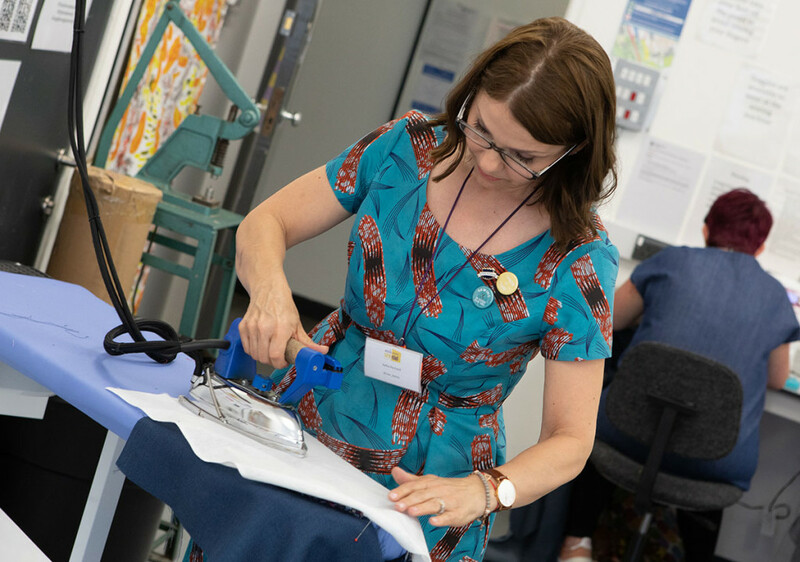 In addition they would benefit from Anne's sewing expertise in a range of demonstrations and have the option to use the industrial machines in the Stitch Room. They would also have full access to a domestic machine to merrily sew away between all of the planned activities. 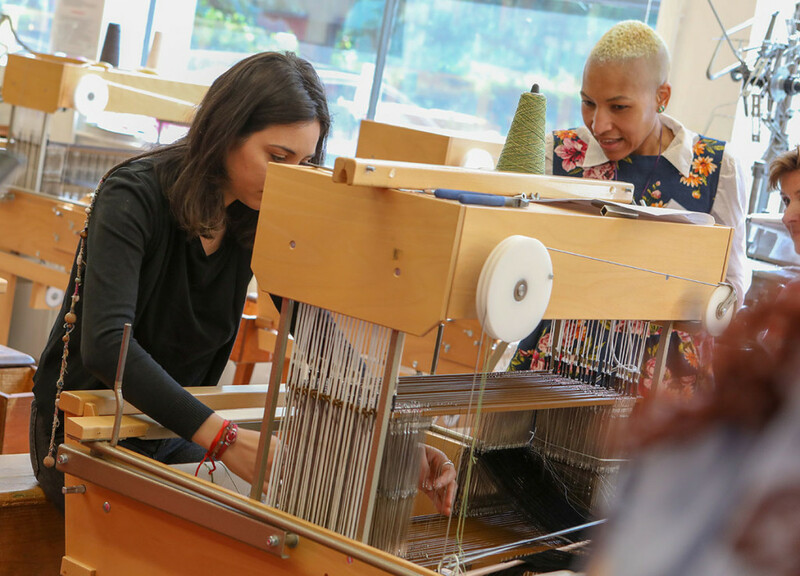 After coffee and chat in the reception area of the Cope Auditorium we led everyone up to the Stitch Room for an introduction and run through of the packed itinerary. The excitement levels had reached fever pitch by now and there was a real buzz in the air. It was such a treat to see all the beautifully handmade garments people we wearing. 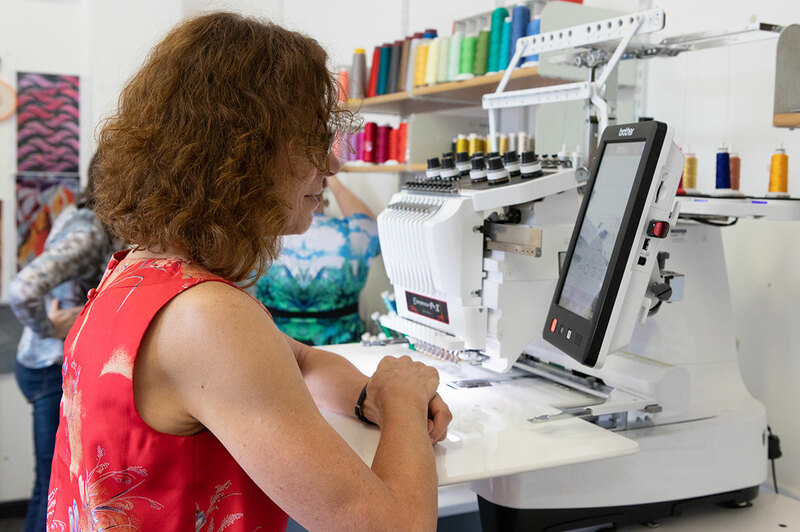 Anne demonstrated a number of industrial machines to the ladies including a bias binding machine, an industrial overlocker and a rolled hem machine. I'm pretty sure the bias binding machine was the firm favourite. It applies the neatest bias binding in a matter of minutes. No fiddling, no faffing. You simply feed a strip of fabric, cut on the bias, through an attachment and it is applied to your garment in one swift step. No need for pinning or pressing. AKA bliss! The good news is those with a domestic coverstitch machine can experience a taste of this magic! A similar attachment is available for these machines in several sizes. I demonstrated this technique on Angela's Gloria Babylock coverlock machine over the course of the weekend and helped one of the ladies to attach a neckband to the Tshirt she was making. She was thrilled with the results. 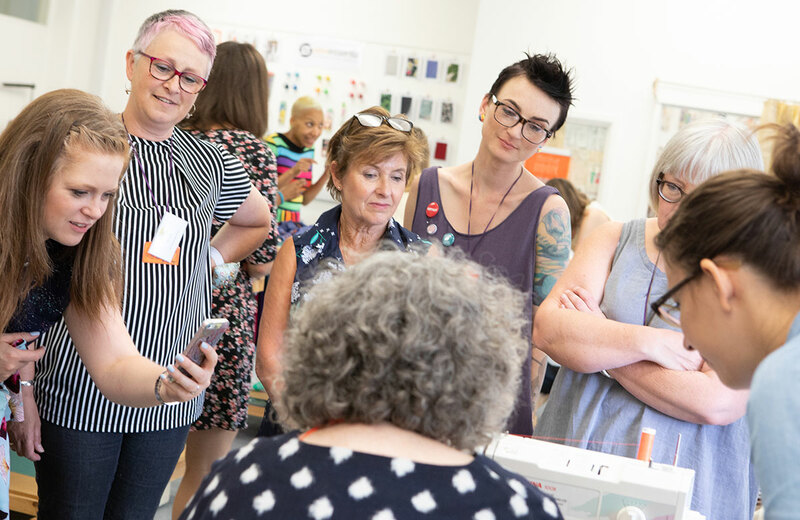 I will share a video on our blog and YouTube channel demonstrating this technique in the coming weeks since it proved incredibly popular at the event. The results are so professional and neat and it is so much easier than the conventional method. We also stock the Janome coverstitch neck binding attachments here. The ladies were also hugely impressed by the industrial irons and ironing boards. They make it a breeze to press even the most stubborn fabrics. Next we visited the print rooms and weave shed. The staff did a fantastic job of talking us through the processes used to create the textiles. Some of the delegates were even able to participate and create their own print. Aside from learning about the processes simply visiting these areas is a magical experience. 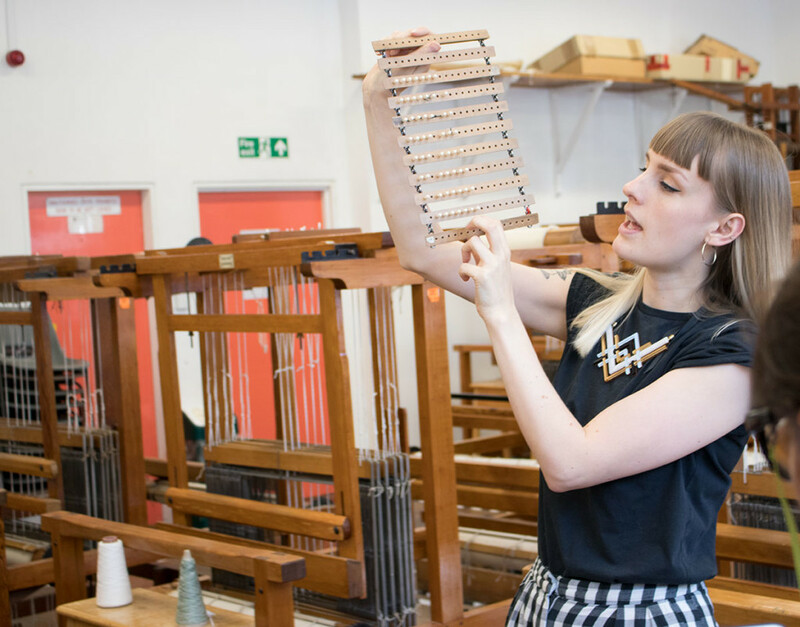 The weave shed is packed with fascinating machinery such as the enormous traditional wooden looms. 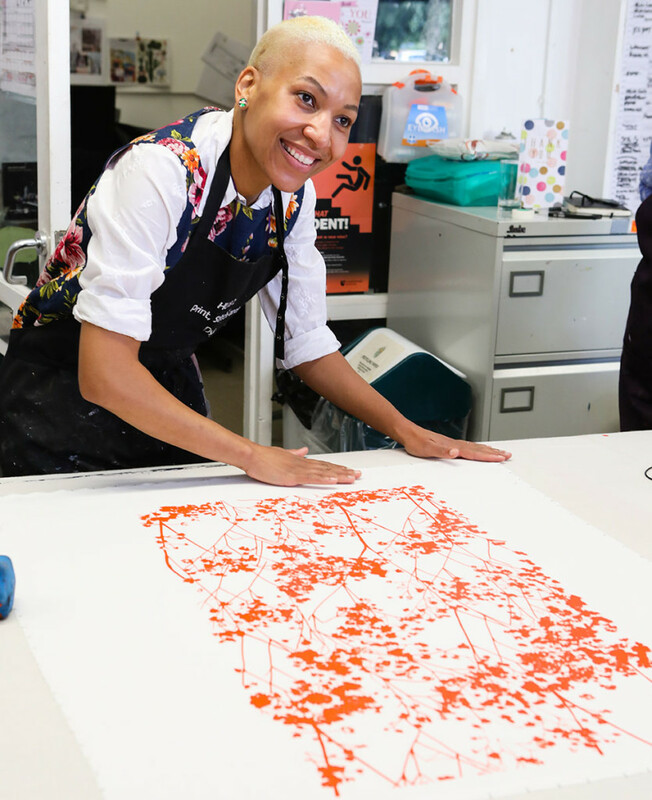 The print rooms are brimming with inspiring designs and colours. It certainly got the creative juices flowing! By this point everyone was ready for a rest and some refreshment. Lunch was provided and the room was beautifully decorated. The table was adorned with a sewing pattern table runner edged with neon tape measures. The chairs were dressed with neon tape measures tied in a bow. A giant photobooth back drop was available for fun photos. The table centrepiece was a sewing themed cake created by Becca of Calico and Cake in Ashby. She immortalised me and Anne having a fitting sesh in cake. 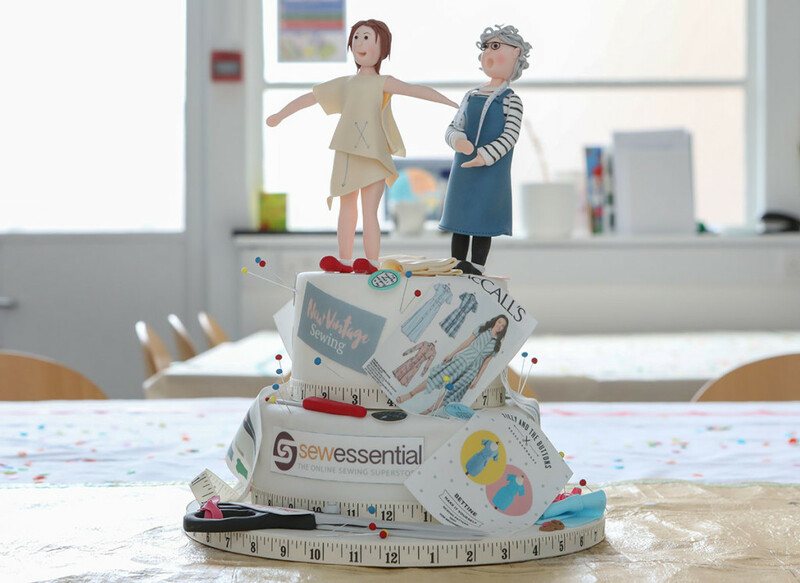 I don't think I need to say anymore - a sewing themed cake! 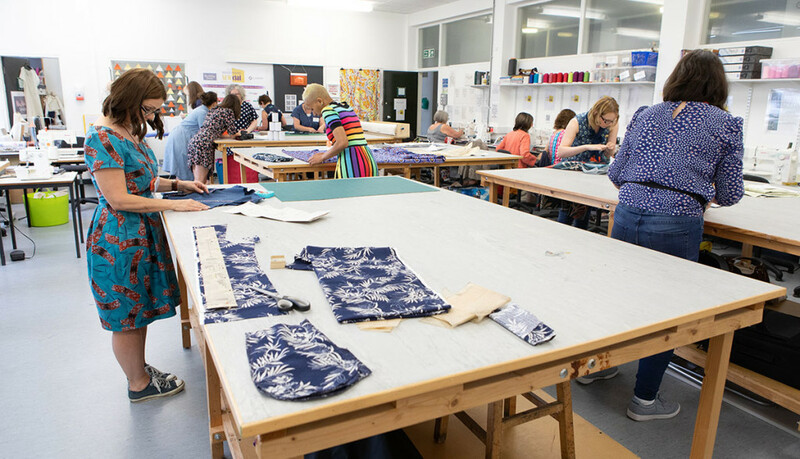 The ladies also had chance to indulge in a pattern and fabric swap in between eating, chatting and enjoying their goody bags. Everybody at the event had the option to sign up for a professional photoshoot with the lovely Jajit who teaches photography at Loughborough University. This was a great chance to get some new social media profile pictures, photograph a latest or favourite make for a blog post or just have some fun. Here is Hila of Saturday Night Stitch working it! She is a complete natural! After all of the activities there was time for some sewing then everyone headed back to the hotel/home to get ready for the evening meal. Those staying in accommodation chose to stay at the hotel on campus. The feedback about the hotel was highly complimentary, it even boasts a spa and swimming pool! In the evening we enjoyed a delicious meal at the Priory on Nanpantan Road. It was the perfect way to end the day - beautiful surroundings and sparkling company with, of course, plenty of sewing chat! 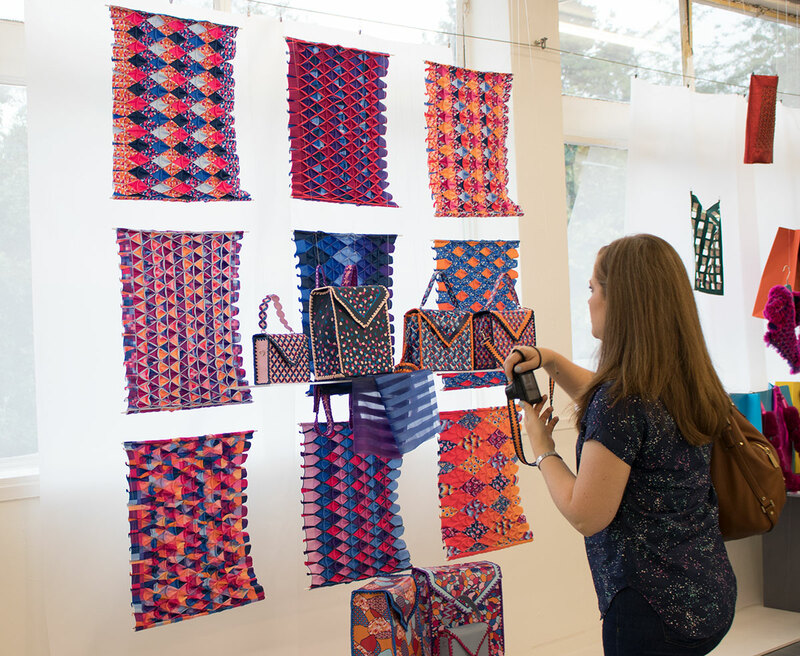 Fully refreshed and raring to go we started day two with a tour of the textile degree show. I think I can safely say the delegates were just as awestruck as me when they saw the exhibition. People were simply overwhelmed and desperate to take the pieces home! 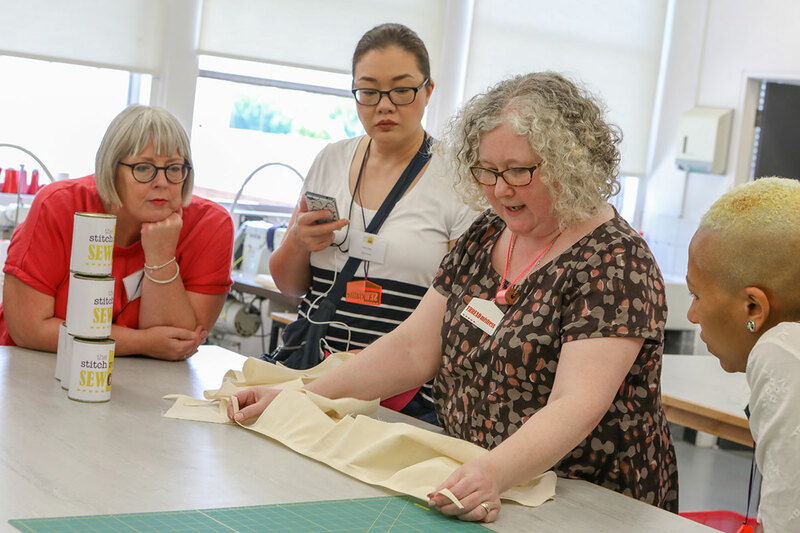 Sue of 'Susan Young sewing' commented that she liked the fact the workshops the previous day helped her to understand how the students created the final pieces. 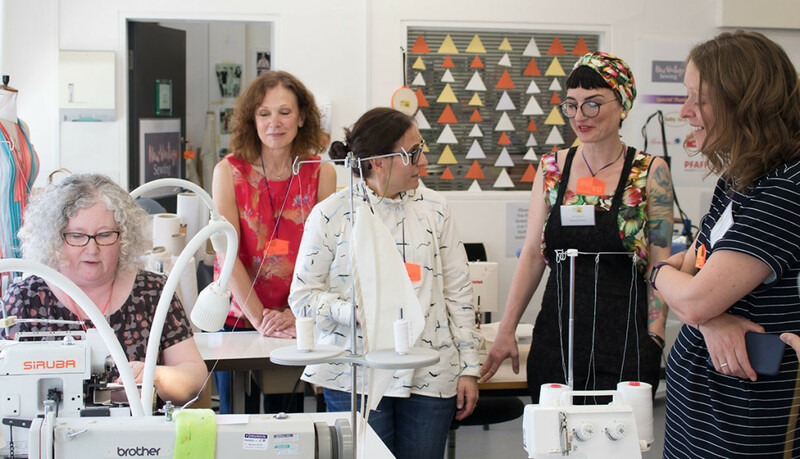 Everyone also had the chance to sign up for a 45 minute machine embroidery session. Bee, one of the lovely technicians at the University, helped each individual to create a design of their choice. Becca of RedWSews embroidered some back pockets for one of her current projects, the Ginger jeans. As huge embroidery machine fans here at Sew Essential it was great to see people having fun with these machines. There was plenty of time for more sewing and further demonstrations from Anne. Anne demonstrated ruffling feet, gathering feet and pintuck feet amongst others. We stock these feet for all the major brands you can find them here just remember to check the compatibility charts for your machine. Everyone loved the giant cutting out tables! 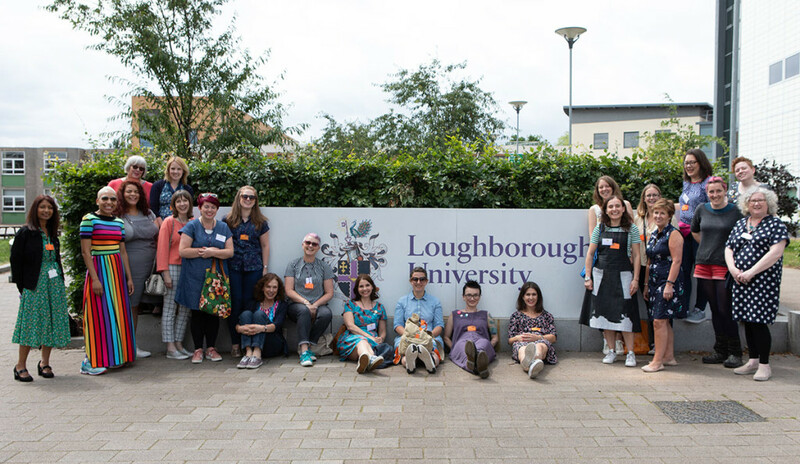 I would like to say a massive thank you to Loughborough University who so kindly supported us and the event. Special thanks go to Bee, Sam (who took many of the photographs above), Darren, Alice, Andy, Jajit and Tessa. It was a wonderful opportunity to showcase the fantastic facilities at the University and I know the delegates were thoroughly impressed. Also a massive thank you to our goody bag sponsors. I'm sure many a make will be born out of the plentiful supplies so kindly gifted. So the big question is: when can I go?! It isn't confirmed yet, but we do hope to host another event next year. The best way to keep abreast of ticket sales is to follow @sewessentialuk and @new_vintage_sewing on Instagram. If you want to get a really good feel for the event we will also share a video of the event in the coming weeks so stay tuned!